To pick up where I left off....as we entered Agra, my driver stopped at a mosque...I have no idea what it was called, but he told me it was worth taking a look. It was about 12:30pm in the day so it was very hot and there was not much shade throughout the grounds, so I only looked around for a short while. The grounds were very beautiful, with antelope grazing on the lawn...seemed out of place to me for some reason! When I returned to the car park, I was once again greated by people trying to sell me things. This time it was a blind man selling necklaces...so sad. After leaving this area we headed to my homestay...that was after we went to four ATMs before we found one that would accept my card AND had money in it. Who knew so many ATMs would be out of money!!!! From here we attempted to find my homestay, but my driver had never heard of it before, so we stopped several times for directions before we found the side street we were looking for. I stayed at the Taj Home Stay...a suggestion by a coworker who stayed there last year. It was basic accommodations, but the staff were very friendly, they had cheap internet and good food....just what I needed! 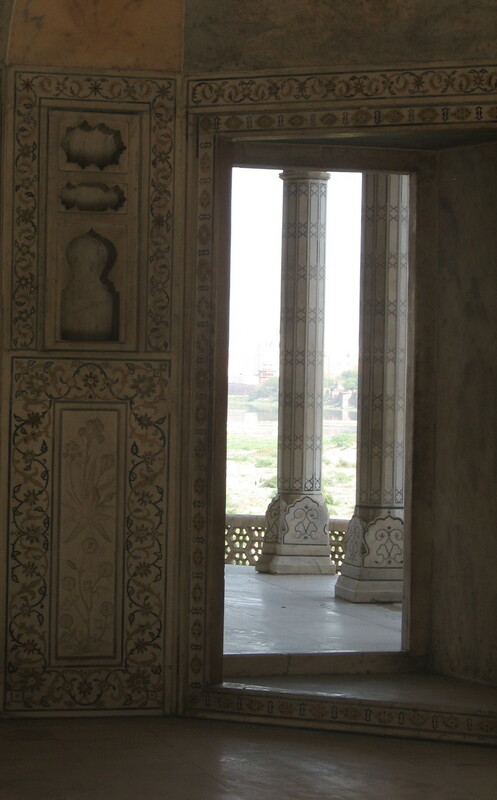 At 3pm my driver and I headed out to pick up my guide who was going to take me through the Agra Fort and the Taj Mahal. Now I'm not a huge fan of doing guided tours, but I decided I might as well learn a bit about these two structures since I came all this way...in the end it ended up being great because my guide knew a few things about the line ups, protocol and how to navigate through all the areas. The Agra Fort is a World Heritage Site that was built of red sandstone by Akbar in 1573 and later his grandson Shah Jahan finished it to look as it does today. 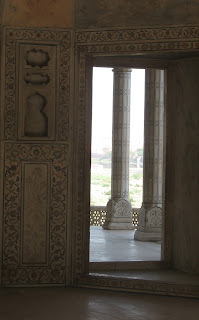 It took eight years to complete and at one point Shah Jahan had his son emprisoned in one section of it. Shah Jahan lived in this fort with his wife and their 14 children...all before the age of 40...who passed away after givinig birth to their last child. The detail work of this structure is incredible...all hand carved from huge slabs of stone. There were beautiful views of the Taj Mahal in the distance...the Taj Mahal was only built after the fort was constructed in honour of Shah Jahan's wife who passed away. There was a double moat around the fort, one filled with water and the other filled with exotic animals as added security. We left Agra Fort and I was taken to a shop where they showed me how they made all the inlay work by hand at the Taj Mahal. This was your typical let me tell you what we do and then try and sell you something. I wasn't impressed about this, so I left there within 15 minutes and made sure my guide knew I didn't want to go to anymore of these shops....which we didn't! We finally arrived at the parking area of the Taj Mahal around 4:30pm. You can not be dropped off right at the entrance, so we took a horse drawn carriage for 10 Indian Rupees (INR) return. It was a few minute ride when we arrived at the East Gate of the Taj Mahal....there are actually four entrances. At this point you needed to wait in line to go through security and the metal detectors...lots of security. Once inside I soon realized how busy it was. There seemed to be a lot of Indian people at the site too, which surprised me, until I found out it was a holiday in India...just my luck!!! all the carvings and inlay work were done by hand and took incredible skill and talent...and time! While I was there I took all kinds of pictures from various locations and views. I could have stayed there all day taking pictures if I had the chance, it was that beautiful. Most of the time I was there it was incredibly hot, until about 5:30pm when the sun started to go down. Once seeing this stunning piece of architecture, there is no doubt in my mind why it is one of the Seven Wonders of the World. We left the Taj Mahal around 6pm....I was exhausted...dropped off my guide and headed back to my homestay. It was a great day...driving and all...and I was ready for a good night's sleep. By the time my head hit the pillow at 8pm, I was out cold.